Bishoujo Senshi Sailor Moon Wallpaper: "Fresh Shower Rhapsody "
Minitokyo »	Bishoujo Senshi Sailor Moon Wallpapers » Bishoujo Senshi Sailor Moon Wallpaper: "Fresh Shower Rhapsody "
This is a really really old wallpaper of mine. Made for Wallpaper Games @ Animepaper.net: Match 05: Bathroom but is no longer available over here. So, it is being uploaded here and linked to WG@AP Archive Blog @ Wordpress. Check it out ! Maybe you can help find a few missing walls. If I recall correctly this was my 2nd official vectored wallpaper. It took me at least a month or probably more to get this wallpaper finished. But I remember having fun vectoring this one. Though the way I learned how wasn't exactly proper technique but I have since learned. 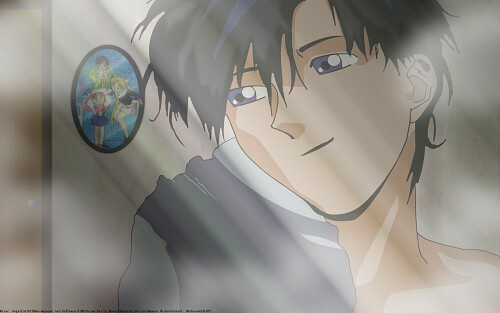 The idea behind this wallpaper was Mamoru/Darien just got out of the shower and caught a glimps of his family on the wall behind him through the mirror and got caught up in a sweet rhapsody of memories. So, that's really all I've got to say for this one... other then.... I know it could it use a little improvement. Like the vector in places but after all this time I am not going to touch it because it reminds me of that time and moment. Perhaps, someday I'll start re-viving and re-editing walls. But not anytime soon. Plus, this is here for the WG@AP Archive Blog. So, a natural state is best. Thanks for viewing and Take Care!